Those who fish at sea, and other who “go down to the sea in ships”, have many occasion to see God’s “wonders in the deep”. All creatures of the oceans and their coast-waters fit that category – because all such sea creatures, by their very lives and life cycles, are “wonders” in water, who give witness of God’s glory and providence, showcasing the amazing Creator He is. 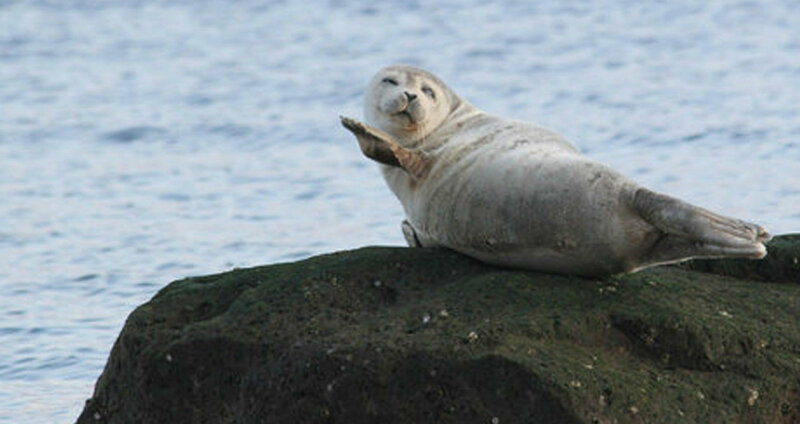 One such example of is the Harbor Seal. The HARBOR SEAL (Phoca vitulina), known in Great Britain as the “Common Seal”, is a creature well-known to the Vikings of old, as is documented below. These fine-finned marine mammals are impressive (if not peerless) swimmers and divers, and they can tolerate a wide range of temperatures (warm, lukewarm, cool, and super-cold!). And, thanks to the super-sensitive whiskers that God designed and installed upon them, Harbor Seals know just where to go, as they chase fleeing fish! Harbor Seals are the world’s most common temperate-water seal, often found along the temperate water coastlines (and continental shelves) of the Northern Hemisphere – in both the northern Atlantic and northern Pacific Oceans, and in coastal estuaries, and sometimes even as far south as Portugal! Oddly, one subspecies (Phoca vitulina mellonae) lives only in freshwater. Seals were well-known for their swimming skill, as is illustrated by the following quotation from an old Viking saga: “There was a man whose name was Gunnar [Hamondsson] … a tall man in growth, and a strong man – best skilled in arms of all men. He could cut or thrust or shoot if he chose, as well with his left as with his right hand, and he smote so swiftly with his sword, that three [swords] seemed to flash through the air at once. He was the best shot with the bow of all men, and his arrows never missed their mark. … He could swim like a seal [emphasis added], and there was no game in which it was any good for anyone to strive with him; and so it has been said that no man was his match…. [Quoting from Chapter 19, NJAL’S SAGA. See, accord, Magnus Magnusson & Hermann Pálsson, NJAL’S SAGA (New York: Penguin Classics, 1982).] Vikings, including Gunnar’s Icelander contemporaries, were obviously impressed with the superlative swimming skills of seals! 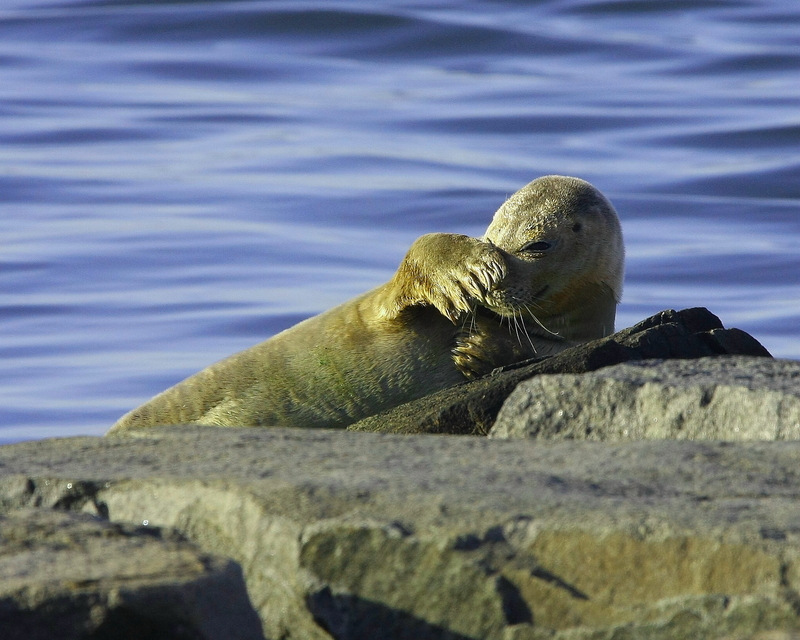 As a marine mammal, the Harbor Seal is a “pinniped” – i.e., it has fins, not feet. Also, it is earless (i.e., bearing no external ears) and carnivorous (eating animals of the sea). Being mammals, the seal mothers (“cows”) breastfeed their children (“pups”), as do mothers of all mammal species. 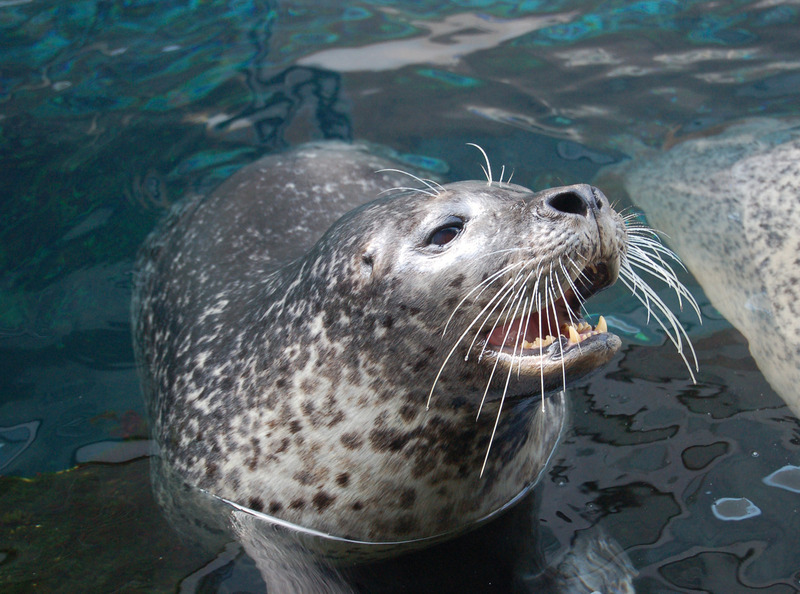 Regarding size, the adult Harbor Seal ranges from 5 to 6 feet long, with bulls (males) a bit larger than cows). Body weight can approach 375 pounds! 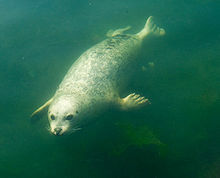 The Harbor Seal’s four flippers are ideal for swimming (as well as for diving and surfacing), and are not designed for a lot of “shore duty” walking, so seals move on land by undulating, like a caterpillar. These flippers have webbed digits – like finders or toes blended together – which can be used to scratch, groom, or provide defensive movements – and they stroke powerfully for precision swimming. But daily life, for a harbor Seal, is not all about swimming – they often “haul out” on shoreline or harbor-water rocks (or sandy beaches), to rest, to bask, to molt, to nurse babies, to give birth, and even to congregate with other seals for defense (e.g., against predators who cannot leave the seawater, such as orcas, a/k/a killer whales). Mother seals usually nurse their suckling pups at low tide. Ironically, seal reproduction occurs at sea. Like humans, seal gestation lasts for about nine months; after birth, on shore, lactation lasts for about 4 to 6 weeks, with the birth weight of baby pups (as much as 35 pounds) doubling (i.e., to as much as 70 pounds) by the time they are weaned off their mother’s fat-rich milk. Within hours of being born the seal pups can dive and swim – and their future lives will continue that habit for years to come. When it comes to life at sea – and the Harbor Seal’s true home is the water – the pinnipeds display their Creator’s design-bioengineering to imagination-stretching levels (or depths!). Although Harbor Seals sometimes sleep on land, they can even sleep in the water, subconsciously surfacing for air as needed. Diving, and swimming, underwater, is a seal’s quintessential element – whether that be in the ocean, an estuarial bay (i.e., “harbor”), or some freshwater river flowing into the sea. These seals can dive even more than a half-mile deep, when searching for food, and can remain underwater for about 40 minutes (though most dives last only around 5 minutes) – then they must return to the surface, to replenish their air for breathing. 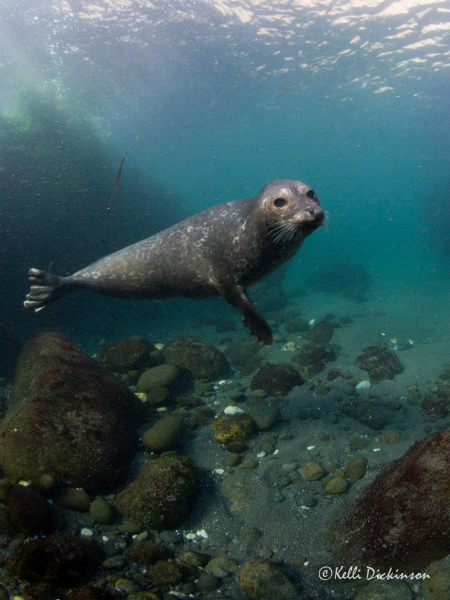 When seals dive into the ocean, their God-given interactive sensor-systems (which measure oxygen levels) and pre-programmed instincts adjust their physiology to their underwater diving needs. When the seal’s face is submerged, it automatically holds its breath, its heartbeat slows by up to 90% and its blood circulation is reduced, except to the most vital organs, the heart and brain. … The dive reflex is responsible for the seal’s ability to remain submerged for long periods. The harbor seal breathes out before diving, reducing its buoyancy. Also, the harbor seal has a very high blood / volume ratio, about 1.5 times that of a human. This allows a large amount of oxygen to be carried in the bloodstream instead of the lungs. The harbor seal has high myoglobin levels, allowing high levels of oxygen to be carried in the bloodstream and tissues, about 2.5 times that of a human. [Quoting from AquaFacts: Harbour Seals (Phoca vitulina), posted by Vancouver Aquarium Marine Science Center, 2005, pages 1-4, citing Steve Kleene’s “A Medical Marvel: the Diving Seal”, SEA FRONTIERS, 35:370-374 (Nov.-Dec. 1989). Even the sea’s whiskers help – the nerves inside seal whiskers help sense underwater pressure changes; the whisker nerves trigger internal physiology adjustments that are needed to optimally respond to those changing underwater pressures. When waters are murky, how do seals find fish? They don’t have a sonar apparatus like whales, and yet they somehow hunt successfully in the dark. It turns out that the seals follow fish trails by sensing very subtle water pressure changes with their whiskers. In a study published in the Journal of Experimental Biology, investigators trained harbor seals to give a visual signal indicating the direction of a “swimming” rubber fin that mimicked a fish. They then blindfolded and placed headphones on the seals to test their ability to hunt without sight or sound cues. The authors found evidence that the seals track the direction that a fish swims by sensing its underwater wakes, or trails of slightly disturbed water, that linger for up to 35 seconds. To do this, seals detect and interpret “the structure and spatial arrangement of the vortices” that spin off from a fish’s underwater trail. The best explanation for the origin of these complex creatures remains the one presented in Genesis–that on the fifth day of creation, God said, “Let the waters bring forth abundantly the moving creature that hath life,” and it was so [Genesis 1:20]. As warm-blooded mammals, Harbor Seals need to burn food energy to keep warm. Blubber helps to insulate the seal’s core but food energy is a must, constantly! 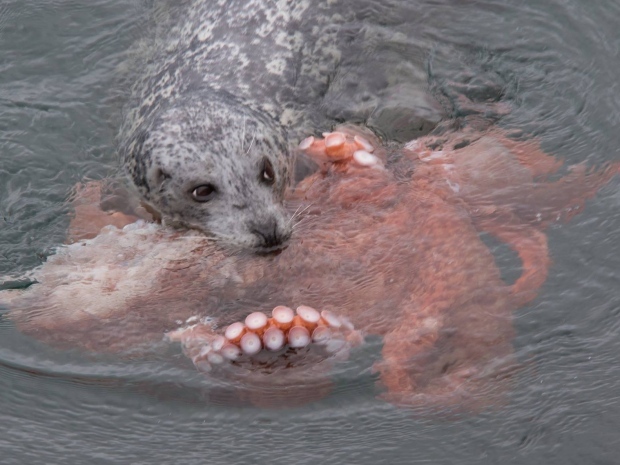 So, to maintain their body temperature, especially while they swim in super-frigid seawaters, they must eat a lot – and they are habitually hungry! 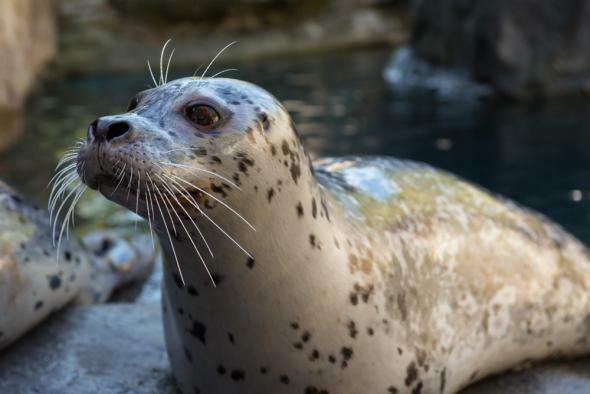 Harbor Seals don’t really “chew” their food, though – rather, they bite and they tear, they crush with their molars, then they quickly swallow whatever meat they eat. 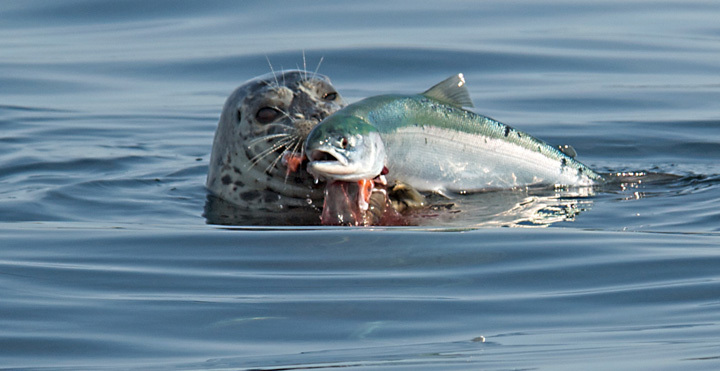 Perhaps a fitting greeting to a Harbor Seal would be “Bon appetit!” But seals have a right to be hungry, and to eat a lot, because God made them to operate that way – they have a lot of work to do, as they eat and swim and dive, always displaying God’s marvelous bioengineering ! This entry was posted in Bible, Creation Science, Mammals and tagged Common Seal, diving, Harbor Seal, Njal's Saga, Psalm 104:24-25, Psalm 107:23-24, swimming. Bookmark the permalink. ← TESTING: Lab Rats, Guinea Pigs, and Nuclear Bombs! This article definitely has my “seal” of approval. Thanks, Lee. And you and Dan please stay safe during Hurricane Matthew’s visit to Florida. Glad to here you guys are okay.